The United States Congress is supposed to be making laws that benefit Americans. But as we’re about to find out, that is not always the case. These days, a lot of their bills are only passed to favor large corporations and some influential citizens. It’s little wonder Americans prefer cockroaches to congressmen. Nevertheless, there are lots of facts you might not know about the US Congress, such as their private subway, their television station, and their fondness for editing Wikipedia. 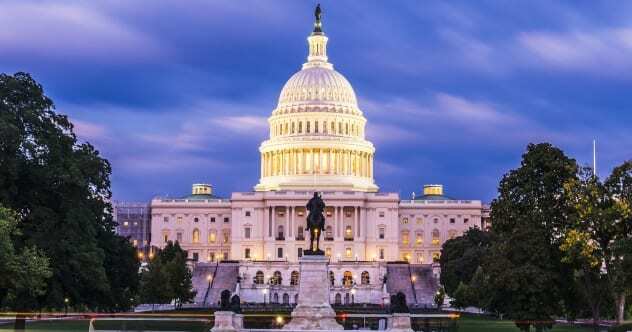 Here are ten surprising facts you didn’t know about the United States Congress. A 2013 survey of 502 registered voters by Public Policy Polling revealed that Americans have a very low opinion of Congress. We mean that Congress actually had lower approval ratings than dog poop, witches, toenail fungus, potholes, hemorrhoids, zombies, mothers-in-law, the IRS, and cockroaches. Humans are wired to hate cockroaches. The study also revealed that 86 percent of Americans disapproved of whatever congressmen were doing in Congress. Only eight percent approved, and six percent were unsure. That doesn’t mean Congress is that bad. At the very least, they had higher approval ratings that Vladimir Putin, Syria, heroin, and the Ebola virus. “Filibuster” is a word you’ll often hear in relation to the US Senate. It is basically an attempt to delay a vote by giving unusually long speeches that are often irrelevant to the bill to being voted upon. Filibusters happen because the Senate has always worked around the idea that everybody can talk as long as they want. Senators know this and will keep talking to delay the passage of bills. The record for the longest filibuster in the US Senate is held by Senator Strom Thurmond, who gave a speech that lasted 24 hours and 18 minutes in an unsuccessful attempt to stall the vote for the passage of the Civil Rights Act of 1957. He is closely followed by Senator Wayne Morse, who gave a 22-hour, 26-minute speech in 1953. One of the weirdest filibusters was delivered by Senator Huey P. Long in 1935. He was attempting to stall a bill that would have favored some of his political rivals. Senator Long recited Shakespeare plays, oyster recipes, and lines from the US Constitution during his 15-hour, 30-minute speech. Staff at the Capitol are fond of editing the Wikipedia pages of the congressmen they work for. In 2014, Wikipedia even banned Congress IPs from making edits on the site for ten days. Wikipedia cannot confirm the precise origins of the edits because the whole Capitol Building has a single IP address. And did we mention that the editing is paid for by taxpayer money? The pages of rival congressmen are not spared, either. Staff will often add unfavorable and sometimes untrue information to the pages of their bosses’ rivals. Once in the 2000s, somebody edited Representative Eric Cantor’s page to claim he smelled like cow poop. Wikipedia edits from Congress made the news again in 2014 after the pages of several political figures and incidents were tampered with. Former Secretary of Defense Donald Rumsfeld was called an “alien lizard who eats Mexican babies.” Nataliya Vitrenko, a Ukrainian politician, was accused of being a Russian agent, and Lee Harvey Oswald was accused of being a Cuban agent. Cuba was also accused of starting the Moon landing conspiracy theories. Crazy edits like this are what led to the above-mentioned ban on edits from the Capitol Building. The news blog Mediaite was also said to be a “sexist transphobic” site that “automatically assumes that someone is male without any evidence.” The blog was probably targeted because it had exposed the fact that congressmen and their staff were fond of editing Wikipedia. The United States Congress had a turbulent beginning. Many Americans, including the congressmen themselves, had low opinions of the congress. The US Congress sat for the first time on March 4, 1789. At the time, they met at Federal Hall in New York. Only 21 congressmen (eight senators and 13 representatives) out of 59 were present. The rest could not attend because they were sick, were delayed by the weather, or were busy with their businesses. A few states also had yet to hold elections. James Madison, one of the Founding Fathers of the United States, was ten days late at the time he arrived on March 14. Interestingly, most congressmen were still missing even then. By April 1, only 29 of 59 members had arrived. Nevertheless, Congress went on to count the electoral votes that saw George Washington defeat John Adams to become president. Congress was still ineffective during Washington’s presidency. John Adams, the vice president of the United States and president of the senate, worsened the situation. Adams spent a huge chunk of his time fighting the senators. He was bitter that he didn’t get enough votes from the electoral college to become president. Alhurra TV is part of the Middle East Broadcasting Networks (MBN), a group of media companies set up and funded by Congress. The group includes two television stations, (Alhurra and Alhurra-Iraq), two radio stations (Radio Sawa and Afia Darfur), and several websites (Alhurra.com, RadioSawa.com, Irfaasawtak.com, and maghrebvoices.com). In truth, the media group was set up to counter pro-Middle Eastern outlets like Al Jazeera and Al-Arabiya, and even pro-Western media groups like BBC Arabic and CNN Arabic. However, the Middle East Broadcasting Networks are controversial in the Middle East and North Africa, where they are viewed as a propaganda arm of the US government. The United States Capitol Subway System is a private subway under the Capitol Building. It was launched in 1901 to allow congressmen and their staff quickly move to and from their offices. Trips are short and barely last one minute. The subway started off as an underground road. At the time, transportation services were provided by battery-powered cars that traveled at 19 kilometers per hour (12 mph). The cars ran backwards for the return trip. The road was replaced with a monorail in 1912. This shortened a trip to a mere 45 seconds. The front seats of the trains were reserved for senators, who called the trains by ringing a bell. The subway tends to be most busy during votes. The December 7, 1941, bombing of Pearl Harbor was the proverbial last straw that forced the US to enter World War II. However, President Franklin D. Roosevelt couldn’t just declare war. Congress is responsible for deciding whether the US will officially get involved in war or not. Unfortunately for Rankin, people wanted Congress to declare war. The crowd outside was so outraged that they threatened to beat her up. She remained in a cloakroom until police arrived. Rankin became so unpopular that she did not seek reelection after completing her term. This was not the first time Rankin would be opposing the involvement of the US in a war. She also voted against US involvement in World War I. However, she had more supporters at the time. She and 49 other representatives voted against the war, while 373 voted for it. Desk 80 in the US Senate is informally called the “candy desk.” This is because it contains candies available to any member of the US Senate for free. The desk has always been occupied by Republicans, something the Democrats are not very happy about. This motivated the Democrats to create a candy desk on their own side, but it is less popular. The candy desk was created by Senator George Murphy, who was elected to Congress in 1965. Senator Murphy often took candy to Congress and shared it with other senators, irrespective of their parties. Murphy never got reelected, but the senator who got his seat kept his tradition going. We only got to know about the desk in 1985, when it was assigned to Senator Slade Gorton from Washington. Gorton only stocked the desk with candy made in Washington. These days, senators occupying the desk only stock it with candy from their states. Candymakers have caught on and will usually donate free candy to the senators. US law forbids senators from receiving gifts worth more than $100 from any person or organization. However, candymakers are allowed to donate their products on the condition that they will be available to all senators regardless of their parties. Lobbying is controversial in the US, where it has been likened to legal corruption. This is because influential people and businesses can pay money to a senator through a middleman (called a lobbyist) to pass laws in their favor. In 2011, it was reported that 30 American corporations spent $400,000 a day between 2008 and 2010 to lobby Congress. The money was way more than the amount they paid to the government in taxes. During the same period, 29 of the companies, including Verizon, Boeing, Mattel, and Wells Fargo, lobbied Congress so well that they were exempted from federal taxes. FedEx paid just one percent (instead of 35 percent) in taxes. As of 2015, large corporations were doling out around $2.6 billion a year to lobby Congress. This is more than the $2 billion Congress received in funding. Lobbying is successful in the US because lobbying firms hire former senators and former experienced Congress staff as lobbyists. This works because these people are usually familiar with the congressmen, making them more likely to be successful. Despite their differences, Republican and Democratic congressmen meet to enjoy a game of baseball together every year. The first game was held in 1909, when John Tenner, a representative and former baseball player, organized the first games. The game ended in a win for the younger Democrats, who defeated the older Republicans 26–16. Not every congressman liked the game, though. In 1914, Speaker James Beauchamp condemned it because members were playing when they were supposed to be voting on a bill about cotton. The congressmen suspended their game because of the rain but did not return to the chamber because they were supposed to be playing. They couldn’t vote on the bill when they finally did come in because they were so preoccupied with the game they couldn’t play. Speaker Sam Rayburn also condemned the baseball game in 1958, when he said it should be canceled because congressmen were becoming confrontational.